Josef von Sternberg’s first big commercial success was the silent movie Underworld (1927), which is considered to have launched the gangster film genre. Based on Ben Hecht’s short story about the Chicago gangster scene, the film earned Hecht an Academy Award for Best Original Story . Already with this film, von Sternberg’s complete mastery of cinematic artistry in its many forms is evident. While Hecht’s story is all about the brutality and fierce codes of honor that reigned in the criminal gang world, von Sternberg introduced a more personal feeling of existential desire and isolation to the story. Hecht was so unhappy about the changes that he initially (before he became aware that the film would be a hit) wanted his name removed from the credits. 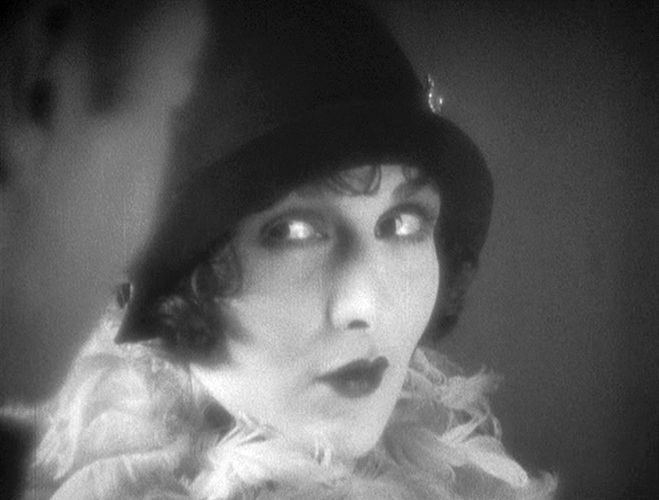 But von Sternberg’s narrative additions greatly enhanced the story. The film’s story concerns events surrounding the exploits of a notorious gangster, Bull Weed, whose daring, violent robberies seem to be beyond the police’s ability to do anything about them. In this film, the focus is on individual gangsters and not, as it would be in later gangster movies, on the ruthless extent of the “mob” – seen as some kind of shadowy shape-shifting force with near limitless reach. 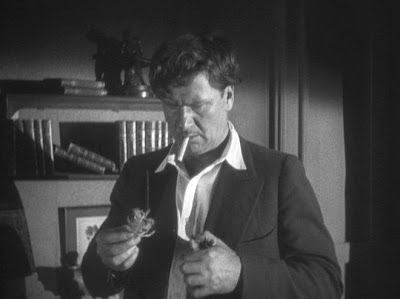 Although Bull Weed seems to have a gang of accomplices, you rarely see them in the film. His principal rival is not the police, but another ruthless gangster, Buck Mulligan, whose “cover” occupation is the operation of a flower shop. Bull Weed is the super-confidant and assertive macho male. He is unreflective and thoughtless, but he is not usually cast as an inherently bad guy. He is just used to getting his way with women and running roughshod over the more sensitive types of people. 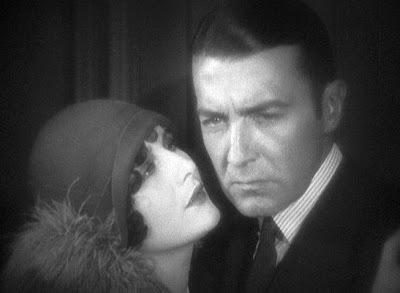 Rolls Royce is the civilized, sensitive, and more cautious figure, particularly when it comes to romantic situations. This personality is presumably a reflection of von Sternberg’s own persona. Feathers is the beautiful, passionate idol – the object of everyone’s desires who must choose between the two men who desire her. The film narrative runs through four stages of narrative development among the characters. Note that Hecht’s original story really only covered the last of these stages, or acts, and essentially everything before that final act was added by von Sternberg. 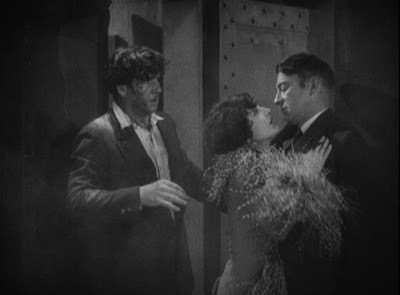 In the aftermath of a bank robbery, Bull Weed grabs a loitering drunk who might be a witness and takes him back to his hideaway. 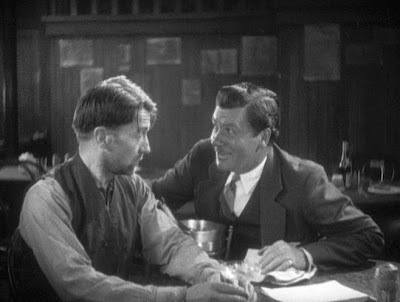 The drunk assures Bull Weed that he is as quiet as a “Rolls Royce”, and that becomes his nickname. Bull Weed and Feathers are later seen at the Dreamland Café, a hangout for the criminal element, where Rolls Royce is now working as an attendant. Weed's rival, Buck Mulligan, is shown as brutal, but his impotent, secondary status compared to Weed is clearly established in this sector. Later Bull Weed takes Feathers back to his hideaway and shows off his accomplishment – he has cleaned up Rolls Royce and made him respectable again. Rolls Royce is now a refined, erudite figure of some class, but he is working for Weed and living at the hideaway. Feathers finds him fascinating, but her appreciation for Weed’s pilfered jewelry shows that she still belongs to the gangster. They all attend the annual “armistice” ball that is held by the underworld and at which all rivalries are set aside for the evening. 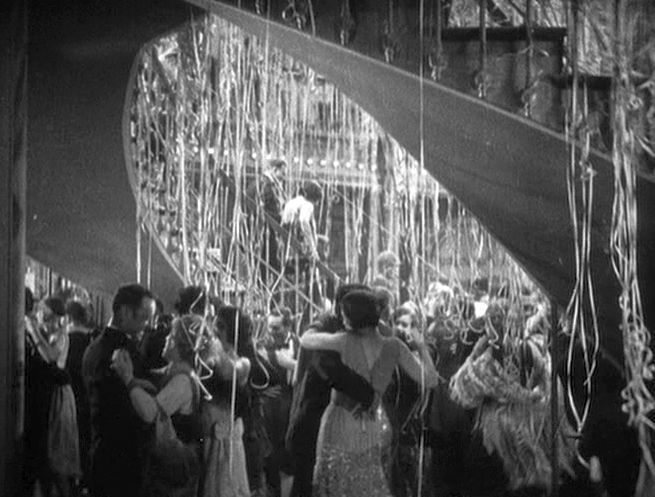 Von Sternberg’s visual display of the extravagant goings on here is lavish, and displays his powers of expressionistic presentation. He would offer up further examples of this nature in Dishonored (1931). As the night wears on and debauchery descends to drunkenness, Bull Weed passes out at his table, giving Buck Mulligan a chance to move in on Feathers. He corners Feathers in a back room and tries to put the make on her. Bull Weed, however, is revived in time and staggers over to break up the sexual harassment just in time. Then he chases Mulligan back to his flower shop and shoots him dead. Bull Weed is quickly arrested for the murder and sentenced to hang and thrown in jail. Now Rolls Royce works to prepare to spring Weed from jail before he can be hanged. With Weed away from the hideaway, though, Rolls Royce and Feathers find themselves mutually attracted to each other, and they consider running away together before guilty consciences make them drop their plans. 4. Rolls Royce at the train station as a decoy. 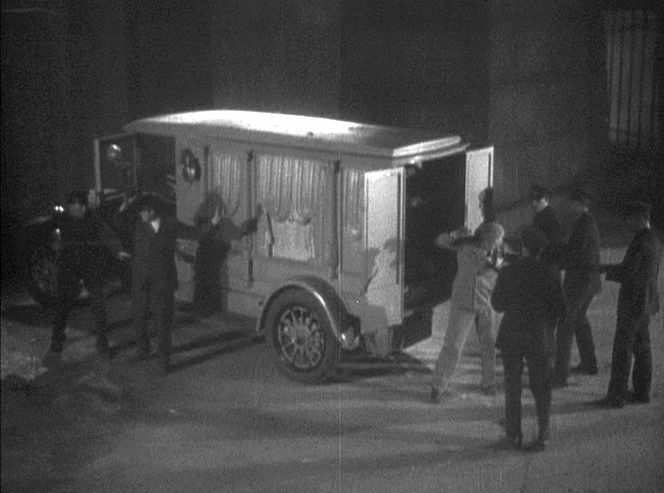 For unexplained reasons, however, the police get wind of the breakin plan, ambush the gang, and foil the plan. Weed, thinking that Rolls Royce has betrayed him, manages to break out of his cell anyway and make his way back to his old hideaway. There he finds Rolls’s cigarette case with one of Feather’s feathers in it – further confirmation in his mind of the betrayal. Feathers now returns to the hideaway, unknowingly trailed by the police, who now know they have cornered Weed inside. An intense police machine gun bombardment ensues, with Weed firing back with his own stock of weapons. Rolls Royce heads back to the hideaway, too, to see what he can do. This leads to the melodramatic climax. Although Underworld has themes of loyalty and honor, it is not these elements that make the film stand out. What is truly memorable about the film is its expressionistic evocation of the dark, relentlessly intense psychological environment of the criminal world – a world of reckless machismo excitement that often ends badly. This is what makes Underworld one of the great early films noir. The short bursts of violence, which are in the form of robberies, bombing, killings, and police captures, are startingly brief and brutal. They seem to come out of nowhere like a flash of light. When Weed’s gang is ambushed, it’s all over in seconds. When Weed breaks out of jail, the viewer barely sees what happens, it’s so quick. This contrasts with the slow movement towards intimacy between Rolls and Feathers in the second act. This is all conveyed by meaningful glances and gestures. During the third act there is the remarkable buildup of tension as Weed plays checkers with his cell guard while he waits for his rescue. Time seems to be moving at a snail’s pace. Then, as mentioned above, his gang is quickly captured in an ambush; and it’s all over in seconds. The violent shootout at the end is also spectacular. It goes on and on, and it seems that the vast horde of policemen shooting at Weed’s upstairs window have the intention of destroying the entire apartment building. Nevertheless, even in the midst of all this incredible violence, it seems that Weed becomes more human and less of a role player. At the end his narrative journey is as important as those of Rolls Royce and Feathers. Underworld was a remarkable achievement for von Sternberg, who was at the early stages of his career. The awards now known as “Oscars” were not yet called by that name then.